Renewed interest from general recycling buyers resulted in Glass prices increasing during the week. Buyers initially targeted Aggregate supply however when supply became hard to source many turned their attention to the Remelt market which resulted in prices increasing in both markets. An easing of Wood supply was evident with volume tonnage being offered to buyers albeit at higher than current market prices. We are due to see Septembers supply figures reported next week and this coupled with the Q3 supply figures (22nd) should provide some insight into the challenges ahead before the end of the compliance year. All prices, with the exception of EFW notes, have been at record price levels this year so one would expect to see supply in good health. Reflecting on the last set of figures released for Q2, we had seen a record return for Plastic yet over the last quarter prices have continued to rise. Some commentators have said that this has been down to the domino effect of Far East countries implementing more stringent quality protocols taking the lead from China. There has been some dispute regarding the actual figures with HMRC export numbers not tallying with reported prn supply for the year. Regardless of the ongoing debate regarding the current figures it is expected Plastic will again meet its target. This week we saw the Steel note price fall for the first time any many months. It would appear that it is positioning itself at a level which will result in buyers targeting it for general recycling obligations. All other prices remained within their previously reported spreads. The debate on Plastic waste continues to dominate media headlines with a groundswell of activity now focusing on new technologies to recover and reuse the material. One compliance scheme, Ecosurety, has taken the lead and committed to securing all prns generated from Recycling Technologies new plant in Scotland. Recycling Technologies have developed a process in which the Plastic waste can be refined back into an oil product for a variety of uses. It is hoped that this will be the start of further developments in the Plastic waste sector but it will take considerably support from all stakeholders to ensure these new technologies succeed. Previous opportunities to develop new methods of dealing with the material became unstuck when the virgin oil price dropped and made the new products overpriced. Glass Aggregate and Paper prices increased this week as buyers continuing to target the lowest value material prns for general recycling obligations. The availability of Wood recovery notes eased with sellers offering volume tonnage to the market. Wood prices continued to maintain their spread with concerns still dominating this market. Discussion surrounding the redesign on the PRN system continued this week with news on a new group being set up to discuss the implications. The Packaging Scheme Forum held their first meeting to discuss the impending revision of the Packaging Waste regulations. The Forum has been established by 45 of the 50 producer compliance schemes and aims to inform and provide guidance to regulators regarding the existing system. The forum will also look closely at the upcoming consultation on revising the system and provide there in depth knowledge in meeting the renewed challenges ahead. Unsurprisingly trading activity fell this week with many stakeholders heading to the RWM in Birmingham during the week. Much of the discussions taking place at the show centered around the current PRN system and what the future holds. It would appear that after many years of trying to fix a system that wasn’t broken they have now decided change is afoot. My thoughts are that the system has continued to deliver on the principals on which it was founded, that being, providing financial support at times when recycling activity is weak and vice versa. Over the last number of years the supply information has not reflected the price position of some materials, namely Plastic, and this will no doubt have added to stakeholders concerns regarding the validity of the current system. While I feel the time is right to redesign the system it would be foolhardy to start a fresh or copy other producer responsibility regimes which have failed to work. More focus needs to be placed on developing the UK’s infrastructure by incentivising domestic recycling. In addition I feel that those businesses who development more environmentally packaging should be provided with some form of credit for the good work they undertake. The Aluminium market was the only one to record increased values this week with prices firming up to £40.00 per tonne. All other markets maintained their previously reported price levels with reasonable volume trading across all materials. Concerns were raised regarding Plastic supply when the market was informed of a major exporter being suspended from issuing evidence notes however this suspension has now been lifted. August’s monthly supply report highlighted a downturn in Paper and Plastic supply when compared against the corresponding period last year. If viewed in isolation it could raise concerns however, as has been the trend this year, the middle month of the quarter has consistently been the weakest reported. With a strong figure reported for July (104k) it is expected a good September return will keep the market on track for the year. As to how the price will react to this news it is anyone’s guess given how prices have reacted to positive news over the last 18 months. This week will see the great and good of the industry head to the NEC (Birmingham) for the annual RWM show. As someone who spent many years attending as an exhibitor it was good to see it streamlined into a two day event as often the last day was quiet, partly due to a lack of attendee’s but also due to the recovery period required from the industry functions from the previous night. I will be in attendance on Wednesday and look forward to catching up with existing clients and hopefully attracting some new ones. I look forward to seeing you all there. After two weeks away from the office I was surprised to see further increases in Plastic notes values. Prices increased up to £70.00 per tonne as stories emanated around further import restrictions to oversubscribed far east markets. Paper, Steel and Glass prices reported small increases as buyers sought out best value for their general recycling requirements, tightening supply in each material. Wood prices have stabilised, albeit at record price levels, and Aluminium volumes reported a small lift due to increased demand. Prices in Plastic rose as exporters reported concerns about the viability of new end markets to take tonnage, which would have previously been destined for the Chinese market. As volumes destined for these markets have grown, they have become backed up with material leading to internal logistical problems. This, coupled with newly introduced export restrictions in these end markets, has increased concerns surrounding the viability of said markets going forward; this has resulted in the latest price increases. The Wood evidence note price has remained stable with reports that at current price levels it is providing strong competition for material previously destined for the bio mass market. A review of the latest published monthly return figures highlights that the average monthly return in Q2 has growth of 10k on the previous quarter. This provides the strongest indication yet that the increased note values are having the desired effect of increasing supply. At current levels the market will satisfy this year’s requirement, although with little carry out and increased targets due to result in demand going up by a further 70k next year, further price increases cannot be ruled out. Trading activity continued to improve this week with prices in some material prices softening to towards buyers positions. In Glass, both note high end values softened by a margin of 25p per tonne resulting in volume trading. Wood values continued to increase up £5.00 per tonne on the previous period, the highest increase recorded this week. Smaller obligated Paper buyers paid a small premium to secure their annual obligations. In Aluminium, prices increased slightly for moderate volume, up £2.50 on the previous week with trading recorded at £32.50. July monthly figures were released this week and reported an increase in Paper and Steel volumes when compared to the same period in 2017. This was to be expected given the higher note values recorded this year as general buyers circle both markets. All other materials reported tonnages down on the previous year. In Aluminium, it is believed that some sellers implemented maintenance programs during the period resulting in the weaker volumes reported but no long term issues are expected. We saw further reports of export restrictions this week along with more negative commentary regarding the state of recycling capacity in the UK. These issues are nothing new to those in the industry and it is heartening to see a more collective effort in addressing them moving forward with reports that the quality of material now being produced from materials recycling facilities increasing. It is hoped the increased quality of material along with the effects of the current competition between the USA and China in impose punitive import tariffs may yet result in a resurgence of Chinese material trading opportunities for UK exporters. This week, limited trading was recorded as the standoff between buyers and sellers prices aspirations softened slightly. In Glass, a small downward price shift resulted in some reasonable volume trading. Plastic prices remained volatile, moving up before settling back at the weeks opening price. Competition for Wood tonnage resulted in prices increasing during the week as buyers continue to target volume. 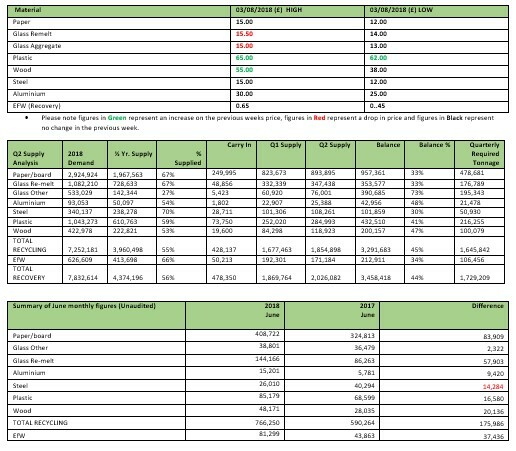 Trading activity returned to the market but reported volumes remain some way behind the corresponding period last year. Confusion continues to dominate the Plastic market with reported supply at odds with the general market outlook. No fewer than six articles were published last week highlighting the export issues in the far east markets. Surprisingly, two weeks after the Q2 supply figures were released we have yet to see any positive commentary from the main industry press. It may be that they, like most of us, are confused as to what message to report. Buyers are slowly drifting back to their desks but there are reports that some are under instruction to hold off purchasing until prices realign in light of the good Q2 supply performance. It would appear that we are heading toward a period of standoff between buyers and sellers. With July monthly figures due to be released this week it is hoped the standoff will break. Buyers are willing to secure tonnage but remain confused that the latest supply picture isn’t resulting in downward pressure on prices even by the smallest margin. A week on from the Q2 supply report which showed great improvements across all materials and we have seen very little effect on market prices. There may be numerous reasons as to why this has occurred. Traditionally demand softens at this time of the year as most traders head for the beaches and this year was no different although many had been watching for news on supply. When it was announced, reporting a more positive position many will have turned off their phones and returned to the beach. During the week, as has become the norm, we were greeted with news of potential export problems stemming from new end markets and this resulted in a softening Plastic price rebounding. All other material note values held their previously reported price spread in what could be best described as the slowest trading week of the year. While weak trading activity has contributed to the lack of price movement this week, the analysis of the Q2 supply report will have played its part as many waited for evidence of how prices would react. Differing opinions created by the inclusion of this year’s “Carry In” tonnage being used in 2018 or 2019 saw predictions of relief or concern. The “Carry In” tonnage is the buffer supply provided by last year’s activity, to be used in times of short supply. It has become commonplace to discount this tonnage as it traditionally gets pushed forward into the following year. I believe that this should be included within the supply analysis for the purpose for which it was designed. The table below shows the “Carry In” included, and projections on required tonnage for Q3 & Q4. Within what looks like a relatively easy task there will be some surplus created which will be carried into 2019. This will be reported at the end of the compliance year to allow it to be factored into next year’s analysis. The “Carry In” information we have to hand this year should be utilised to address the concerns we have this year. Trading activity slowed this week as buyers, buoyed by good volumes reported in the June monthly report, decided to hold off committing to current market prices until after the published Q2 supply figures were released. Paper traded in small volumes with prices holding at the previously reported level of £15.50. All other materials reported little to no activity. The Q2 supply figures released over the weekend reported a strong performance across all markets with the exception of Glass Aggregate supply. The Glass Remelt market is currently creating enough excess to cover the additional Glass Aggregate demand and at current rates may provide some tonnage to General Recycling pot of demand. Plastic supply increased by 30k on Q1 and prices are expected to soften given the news. In Wood, supply increased by 35k in the quarter confirming that this year’s prices are starting to have the desired effect of increasing supply. Both metal grades reported improvements on Q1 with Steel looking like it will create excess of 100k which will provide additional comfort to general recycling buyers. Paper volumes were up and continue to improve. This latest set of supply figures report improvements across the board and certainly appear to favour buyers. With good excesses now being predicted in Steel, Glass and Paper it is hoped this will lift some pressure off the Wood market. If the first set of supply figures raised availability concerns, the second set published this week will provide some comfort. All materials reported a strong showing with only the Glass Other supply failing to meet its target. Glass Remelt volumes continue to provide a buffer to cover the Glass Other obligations and at current rates may yet add some excess supply to the General Recycling obligation. Paper reported a 8.5% increase on Q1 supply and is starting to recover from the perceived short position from earlier in the year. Both Aluminium and Steel reported increases up 10% and 6.9%. In Wood it would appear the increased note value is having the desired effect with supply up 41% on Q1. 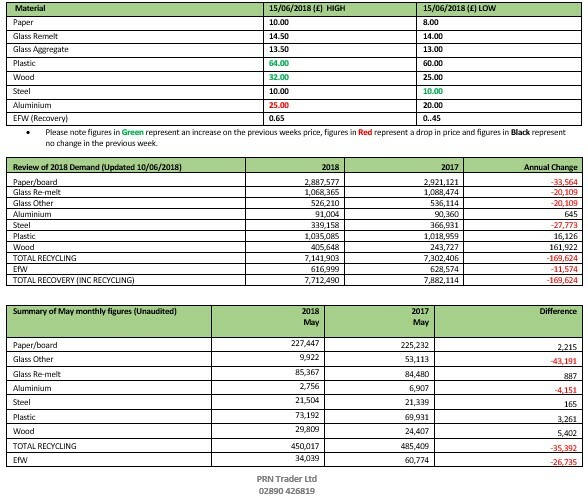 Plastic continues to perform well reporting the highest quarterly return recorded at 285,000 tonnes although it is sobering to point out, as the National Audit Office report recently has, around 65% of this total is generated by the export side of the market. Below I look at each material individually. Glass Remelt supply created a good surplus this quarter which helped to address the undersupply position of the Glass Other market. When demand and supply is combined, this market is on track to meet obligations and with the current heatwave expected to increase supply of material in the later part of the year there is every opportunity for it to record a surplus. Prices are expected to remain stable until the next published figures are released in October. Paper reported an improvement of 70,000 tonnes on the previous period. At current levels Paper material specific demand will be met with the next quarters supply leaving the market with Q4 supply to satisfy General Recycling demand. The figures show that this quarter in excess of 1 million tonnes were issued compared to just 268,000 tonnes in Q1. As Q1 buyers circled the market in search of Paper many were disappointed with the responses of sellers who had limited tonnage for Spot transactions. This created an impression of significant tightness in supply when in actual fact the supply had been generated but was being used to satisfy lower value contracts agreed in the final two quarters of 2017. The additional demand from previously contracted buyers overheated the market and resulted in prices increasing when that demand could not be met. As prices started to increase General buyers looked to other markets to satisfy demand and this additional interest in these markets resulted in prices increasing in all lower value material prns. 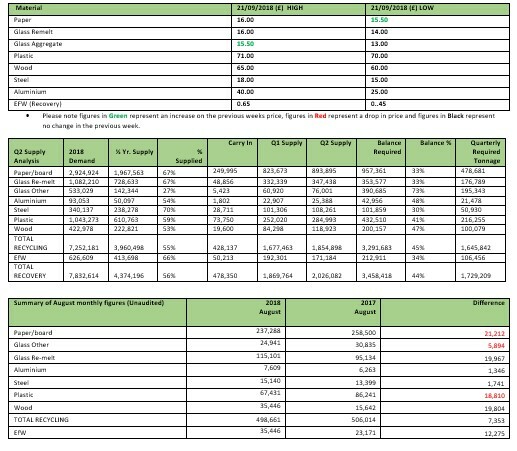 The fact that very little was issued in Q1 and an excess was issued in Q2 when compared against supply confirms that contracts had been agreed just not delivered. A strong showing for Aluminium with supply increasing on Q1 by 10% and now on target. Concerns were raised earlier in the year when 6,000 tonnes of December tonnage failed to be carried across into 2018. This coupled with news of new import tariffs being imposed in the US drove concerned buyers into the market and saw prices increase in the early part of the year. The latest set of figures shows that we are back on track and it is expected that if the supply continues its current trend then prices will soften as the year progresses. The Steel material specific obligation will be met with ease this year but the notes attractiveness for General Recycling buyers should result in continued interest in the excess supply it creates. The additional demand should result in values remaining stable for the next quarter with potential for a slight softening of note values. Very positive news for Wood buyers with supply increasing by 41% this quarter. It is expected that prices will hold at their current levels for the immediate future as it provides a subside at a level which provides strong competition for the recovered material. On current projections this market will meet its obligation this year but will provide little surplus to be carried across into 2019 when next years target increase will result in a further jump of 70,000 tonnes. The Plastic market has recorded its highest quarter volumes even against a backdrop of struggling export markets. It would appear at current price levels we are heading towards creating a surplus supply of in the region of 100,000 tonnes. The is some irony in the fact that 2/3rds of the supply generated comes from the export markets with the figures being released so soon after the published NAO report which was highly critical of this route for reprocessing. The UK market is heavily dependent on oversea markets to deal with our material due to lack domestic plants. In the short term, one would expect this trend to continue given that over the last number of years there have been numerous Plastic recovery businesses located in the UK which have run into financial difficulties. Our reliance on export markets cannot be understated but there are certainly things which could help increase confidence in these routes. With other materials protocol percentages are applied in order to cover such issues as contamination being claimed upon and this would appear to be the simplest answer to dealing with concerns raised in the report. The EFW (Recovery) note reported a downturn in supply but is currently carrying a surplus of over 100.000 tonnes at the mid-point of the year. Evidence notes values are expected to remain at administrative levels going forward. Readers should be aware that this note can only be used for EFW obligations so regardless of surplus it will have no bearing on other note values. The outlook for the year has been boosted by this latest set of figures. The lack of available Wood tonnage for General Recycling obligations will continue to focus buyers concerns but with Paper, Steel, Glass and Plastic now indicating good growth albeit at higher than expected price levels it is felt the situation has greatly improved from the supply position in Q1. With regard to the latest negative reports regarding the overall system, the evidence to hand shows that when evidence note values increase supply increases which is what the system is designed to do. There are valid criticisms surrounding the robustness of the data the market produces but it is up to those who produce the information to ensure it is reliable. The mid-year report card this year should state Great Improvement, Price Increases = Increased Supply, Progress still required, Focus on the information to hand and to those who provide the information, Make sure it is robust and creditable. It was good to see the team at NPWD catch us all off guard and release the report one day early being made available on the Sunday morning. Those who managed to access early will have no doubt dropped their copy of the Sunday times as their eyes cast down the report. Too much relief the news for Q2 was one of great improvement with evidence note generation rising as fast as the temperature. In Wood, supply was up by 41%, reporting 118,000 tonnes for the quarter putting the market back on target to meet its material specific obligation. With little to no excess Wood being generated it was heartening to see Paper supply grow by 8.5% against the previous period. This increase when taken along Q1 supply and this year’s carry in tonnage puts the Paper market in a position to create an excess of around 750,000 tonnes this year all of which will be required to meet overall recycling target. In Steel, further growth of 6.9%, will result in over 100,000 tonnes of excess supply if the trend is maintained. Another market which appears to be heading towards the 100,000 tonnes excess supply position is Plastic which reported a 13% increase this quarter. Plastic, the most talked about market, has seen strong returns over the last 18 months although reviewing the price trend you wouldn’t think that is the case. Some sellers have marveled at the level of reported tonnage being exported with many questioning the validity of the numbers. So it would appear Plastic will continue to be dominated by conflicting views. Which to believe? Audited supply figures or hearsay and negative media articles, I know which side I will be on. Glass Remelt volumes continue to outstrip those of their poor relative Glass Other which is just as well given the Glass Other pot of supply is woefully behind. At the mid-point of the year Glass Other has only produced 27% of supply to meet its obligation. Glass remelt volumes remain in excess with 67% of demand already met. At current rates, and given the expected boost of volume from the recent spell of good weather, there is every chance that Glass Remelt will provide enough excess to meet both the undersupply in Glass Other and General Recycling obligations. The last quarter has been dominated by concerns of undersupply across all materials which in turn has placed upward pressure on prices. The reason why this has occurred centers of the flexible pot of demand know as General Recycling obligations. Buyers who have to secure General Recycling notes have the option to purchase any of the material evidence notes in the market. In the past these obligations have been filled by Paper and Wood surpluses which are generally noted as being the cheapest of the material prns available. The increase in the Wood specific obligation has resulted in a loss of around 200,000 tonnes of the General Recycling note supply and buyers have been eager to secure tonnage in other low value markets. This is why we have seen upward price pressure in both Paper and Steel notes and more recently Glass notes. The latest set of supply figures shows that all markets remain in good health with excess supply now expected to be generated in Steel, Glass and Paper to meet the downturn in Wood. I have omitted Plastic for the simple reason that I do not believe the note value will drop to a low enough level to provide competition with other materials. These figures make very pleasing reading as they provide further evidence that the design of the system works as it should. When note values increase we see that replicated in increased supply. What is concerning is the reaction of the market to hearsay and talk of issues going forward even when published information shows supply in good health. People often discuss the carry in tonnage and dismiss the volumes concerned due to the fact that they generally get carried into the next year. Carry in tonnage is there to act as a buffer for years when issues surrounding supply come to the fore. This year we have seen Plastic Carry In reported at 74,000 tonnes. When combined with the Q1 supply figure at the end of Q1 the market had excess of 66,000 tonnes but yet the Plastic price maintained its price spread of £60 - £70. The latest set of figures show that at the midpoint the market had excess of 90,000 tonnes of Plastic, what price as Plastic PRN in Q3? Who knows but if buyers take anything from this latest set of figures then surely it has to be, concentrate on the published information when approaching pricing decisions and be aware that everything you hear may not be as it seems. There was an air of stability in prices during the last week with most continuing to trade at previously reported levels. 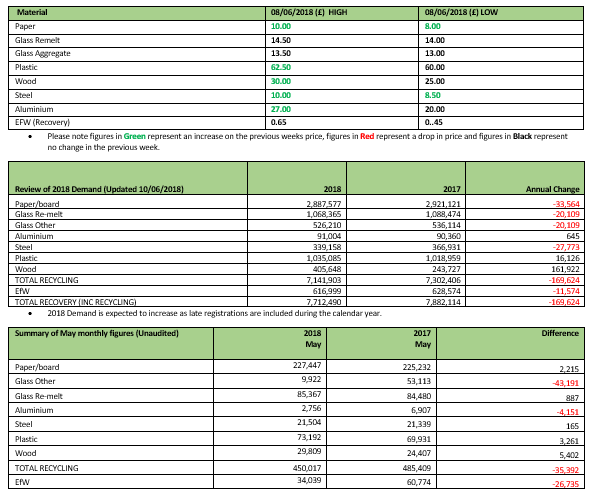 Glass Aggregate prices along with Aluminium reported small increases. Paper, Steel and Glass tonnage continued to compete for General Recycling buying. Towards the end of the week smaller buyers paid a premium for Wood notes but given the volumes transacted (>100 tonnes) I have not reported the increased prices in this week’s spread. Last week’s monthly figures for June were revised up after their initial release to the relief of many. After previously reporting some concerns, Recovery and Steel revised figures, which had reported a deficit supply, showed a healthier position across all markets. Steel supply has dropped in June, when compared against the same period last year, but overall is carrying some surplus from Q1 and Q2. Wood supply remains challenging but we are starting to see some additional activity due to the higher note value. As we head towards what tends to be a quiet period for trading with many away from their desks, it is hoped that weakening demand coupled with a strong Q2 supply report will result in price trends reversing. Challenges will no doubt remain this year, but with evidence now confirming this year’s higher note values facilitating increases in supply, many will hope this trend will continue into Q3 & Q4. In the past week, prices for most evidence notes increased in value. Plastic and Recovery notes held at their previously reported price levels. In Steel, the tightening supply in Paper resulted in buyers reverting to secure Steel tonnage for General Recycling obligations. The increased General Recycling demand also had an impact on the Glass values. As the week closed, both markets where jostling to offer best value resulting in price increases for both Spot and Forward contracts. Wood note values continued to increase with demand outstripping supply. Volume buyers are eager to secure tonnage and are happy to secure at current market levels and above; however, locating supply has become problematic. Aluminium values recorded a small increase on the previous period. Yet again this week we have seen further upward pressure on prices. Wood buyers will no doubt be hoping for a good supply figure to be reported this month given the strength of this year’s pricing. If we do not see supply increase then there will be concerns regarding the further target increase due to be introduced in 2019. Next year it is expected Wood demand will go up by an additional 80,000 tonnes once the new target is applied. Given that we have struggled to meet 2018 demand even at these record prices, one would expect some discussion surrounding a revision of the 2019 target. 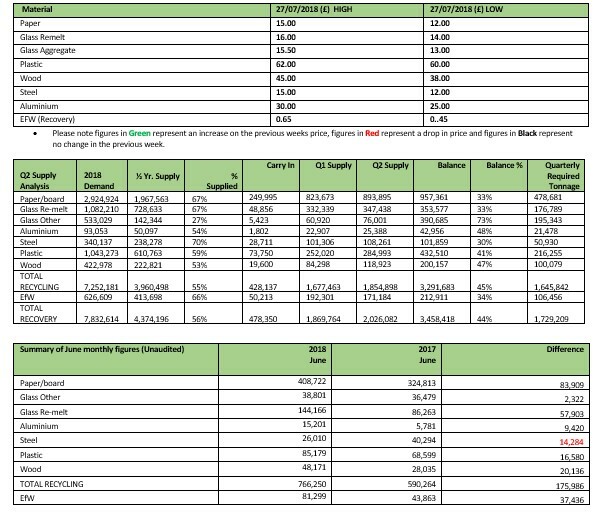 On the 10th of this month (Tuesday) we are due to see the latest unaudited monthly supply summary which will be followed by the publication of the Q2 supply figures (23/07/2018). If the PRN system is to perform as it is designed to, then the increased prices recorded for the first half of this year should result in a boost in supply. If we fail to see any improvement on the Q1 supply report, one would expect those stakeholders who have long questioned the system will have plenty of evidence that it is no longer fit for purpose. Once again this week we have seen further upward price pressure on materials which are being targeted for General Recycling obligations. In both Paper and Steel, prices increased by £2.00 per tonne with limited supply and smaller buying obligations contributing to the uplift in value. Glass Aggregate prices started to increase closing the gap on the current Remelt note price. Aggregate volumes remain weak with smaller buyers happy to secure Remelt notes as an alternative. In Wood further increases were recorded as limited availability continued to effect prices. Aluminium prices started to creep up recording its highest value for the year despite reported supply being reasonably comfortable. This week the Wood Recyclers Association (WRA) released a report on the state of material supply in 2017. The stand out conclusion was that exported material volumes had dropped, with around 300,000 tonnes remaining in the UK when compared to 2016. It also highlighted that 1.7 million tonnes had been recycled into animal bedding and panel board in 2017. At these levels one would expect to see an uplift in evidence note supply however continuing legal issues regarding the storage of material may inadvertently be pushing it to landfill. With Paper and Steel prices continuing to creep up, there are concerns that Glass volumes will soon be targeted within the material mix jostling to meet General Recycling demand. With monthly figures due to be released on the 10th July, quickly followed by the second set of published figures on the 23rd July, buyers will be hoping for more positive news. The principle of the PRN system is that increased note values should result in increased supply, however with little to no growth in supply at current price levels those who question the system may finally have the evidence that it is not working as it is designed to. It was heartening to see prices of Plastic drop this week, although there was little information available as to why this occurred. Given prices had increased for no reason, this price correction was merely following a similar trend. This week’s increases were seen in Glass Remelt and Wood. In Glass, a lack of Aggregate supply has resulted in buyers attention switching to Remelt volumes to cover shortfalls, which resulted in a small uplift in value. The Wood market followed the previous weeks pricing trend, continuing to increase in value. There have been some additional entries to the most recent Wood accreditation list; however with the number of companies registering as small accreditations, it would appear an increase in volume will be minimal. All other materials remained within their previous reported price spreads. It was comforting this week that the increased temperatures we have been benefiting from where not mirrored with further increases in PRN note values. Wood supply is expected to remain questionable for the rest of the year, but it is hoped the recent warm weather combined with the World Cup coverage will lead to increased glass volumes being collected in the coming months. It is hoped this will ease the current upward pressure on Glass prices. It has been an interesting year for Paper with reported supply lower than in previous years, and although concerning, it is felt that a lack of available Spot tonnage has added to the upward price pressure. With around 25% of supply forward contracted in 2017 at prices reflective of last year’s spreads, some believe sellers will have been eager to close these contracts early given the current price differential. It is believed this has contributed to the lack of supply in the first two quarters and facilitated this year’s price increases. This week we saw all materials, with the exception of EFW prns, trade up into double figures. The Paper and Steel markets continued to compete for general recycling buying with each material increasing incrementally in value. The Plastic price increased again with many questioning where this latest price pressure was emanating from. After further investigations it would appear a small downturn in the published monthly return report on the export side has resulted in some concern being voiced by traders. Given the strength of this year’s carry in figure it is surprising to see buyers react so early. Concerns raised regarding the backing up of material destined for the alternative export markets of Malaysia & Vietnam appear to have lifted with sellers reporting material moving freely again. The Wood price increased further this week as we moved towards the biomass subsidy level reported to be between £40 - £50 per tonne. It has been surprising to see little change in the supply figures for Wood given the strength of the evidence note value. There have been reports that some material sellers in the supply chain have seen no benefit from the increased note value which may point to the problem. In Aluminium, prices drifted back with weakening demand resulting in a lack of trading. Both Glass markets reported stable prices this week with no variation on the previous weeks prices. Glass Aggregate supply remains weak with buyers reverting to Remelt notes to cover obligations. As we head into the second half of the year all markets will need to see improvements in supply if the upward price pressure is to be addressed. Wood sellers feel that the current note values remains some way behind the biomass subsidy and expect prices to continue to rise. It looks like Paper and Steel will continue to contend for general recycling demand however with prices moving closer to the Glass note values we may see that market added to the mix. Trading activity this week was subdued against a backdrop of further price increases for this year’s problem materials. Small obligated buyers looking to secure tonnage where happy to pay prices on offer. Once again we saw a number of negative news articles regarding Plastic exports which conflicted with the published supply information. It appears to be common place now that when positive supply information is released it has to be accompanied some form of bad news story. This was a factor in the increased values we saw trade in 2017 but it would appear buyers have become dismissive of these articles and prices drifted back down before the week ended. Paper and Steel prices increased again this week as buyers looked to secure surplus tonnage in these markets for general recycling obligations. Wood prices continue to head north as demand continues to outstrip supply. Good news for Glass buyers with prices remaining stable this week albeit with little visible tonnage being traded through public outlets. Over the past few days I have had the opportunity to get out of the office to visit major reprocessors throughout England & Scotland. I am happy to report that as part of these meetings we have secured volume tonnage to sell for the rest of 2018 and throughout 2019. In addition, we are happy to report confirmation of our first accredited NIEA Plastic reprocessor which has been confirmed by the NIEA. Thank you to those who made the time to see me this week. I look forward to providing a cost effective, trouble free prn trading and consultancy service tailored to meet your individual needs. After the long bank holiday weekend traders returned to their desks with renewed focus on prn procurement. This week news stories regarding the implementation of US import tariffs for Steel (25%) and Aluminium (10%) resulted in some upward pressure on prices. In recent weeks, due to the increasing Paper price, Steel tonnage has been targeted for general recycling demand however as pressure continues to build it is thought that focus will revert back to the Paper market for this buying. Paper and Plastic exporters have been voicing concerns about the new end markets most notably Malaysia and Vietnam. In Malaysia, a delay in increasing import licence volumes due to the change in government has led some to predict a tightening supply in Q2. Stories regarding the backlog of material building up at Vietnamese ports has also increased concerns and has resulted in prices in Plastic rebounding after the softening price trend of the last few weeks. As we drift towards the midpoint of the year we head into unchartered territory. In my 15 years’ experience working in the market I do not remember I time when all materials collectively have come under some supply pressure. We await the release of the next set of monthly figures in the hope that they will present some positive supply news in the face of what appears to be a challenging year. Trading activity was down this week with many stakeholders taking advantage of the warm weather and the early bank holidays to take extended breaks. Plastic prices dropped for the third consecutive week with trading now reported at £60.00, down £1.00 on last weeks reported price. Wood prices increased again as demand continued to outstrip supply. A large UK reprocessor has been granted their accreditation this month and it was hoped that the inclusion of their tonnage would result in some increased supply. Unfortunately due to buyers pressure this tonnage would appear to be already contracted so has had no effect on current prices. Both metal markets, Steel and Aluminium, reported price increases this week. In Steel, it is thought that buyers have already started securing tonnage for general recycling demand given that we continue to see high values reported for Paper volume. Reports of some export tonnage being delayed due to agency administration requirements has also added some upward pressure. In Aluminium, the low carry in figure combined with a lower than expected Q1 supply figure has maintained concerns amongst buyers and this combined with the price increases in other markets has placed renewed focus on Aluminium which has resulted in the current price increase.